Samsung’s terrible fall and winter came to a close this morning at Lincoln Center here in New York City, with the unveiling of the Samsung Galaxy S8 and Samsung Galaxy S8 Plus: Thin, nearly bezel-free phones with truly phenomenally large screens (the Plus has a 6.2-inch screen on the diagonal, compared to just 5.5 inches for the iPhone 7 Plus), that are available April 21. The specs under the hood easily make it best in class. Both sport about as beefy a chip as you can put in a smartphone in 2017. The standard Galaxy S8 packs a 3,000 mAh battery, more than enough to get even heavy users through the day, while the S8 Plus has a similarly burly 3,500 mAh batter. But, man, let’s talk about those screens some more. Samsung has been at the forefront of putting out beautiful screens for a couple of years, moving over to OLEDs long before many competitors (most notably Apple) did. But these put even the incredibly vivid Samsung S7 Edge to shame (an exec did a quick side-by-side demo to prove the point). The screens are technically HDR-capable, the latest buzzword in displays that basically means your dark colors can get really dark and your bright colors can get really bright. You know in every night scene in every movie ever, where it suddenly gets very difficult to tell WTF is going on? HDR takes care of that. There’s also that hard-to-describe feel of the phone. Because the screens on both Galaxy S8s are so much larger, you almost expect a thicker phone, or at least a heavier one. But both come in under 200 grams, with the smaller S8 weighing just 155 grams. But the complete elimination of the side bezel and the near-elimination of the bezel on the top and bottom mean you can have a 6.2-inch screen on the Plus and still use it comfortably one-handed — a truly impressive feat the iPhone 7 Plus and Google Pixel XL still struggle with. The camera is nothing particularly new — a 12 MP shooter — but has seen some backend upgrades that Samsung promises will deliver even crisper shots with deeper colors. Honestly, nearly every smartphone takes photos well enough that all but professional photographers are going to happy, so that isn’t a huge selling point. The fact that they’ve upgraded the front-facing cam to 8 MP and added an autofocus feature, which creates a noticeably more-professional-looking selfie. But Samsung doesn’t just want to sell you a screen and a camera. It wants to sell you a service: Bixby, their response to Apple’s Siri, Google’s Assistant, Microsoft’s Cortana, and Amazon’s Alexa. In demos, Bixby seemed impressive enough — the exec putting it through its paces used natural syntax to make it understand some simple commands, while also moving it seamlessly between voice and touch (something even Google’s Assistant can struggle with). Bixby also promises to recognize where you are and what time of day to perform essentially passive AI — provide you with information before you knew that you needed it. The stuff I need to know in the morning at my home is different from what I need to know at work. There’s also an interesting featuring in Bixby’s ability to search things visually, though they were very constrained demos — Bixby can recognize a bottle of wine by its label! Bixby can read the title of a book! Bixby can recognize a bike! But could Bixby, say, recognize the cut of a jacket? Or a jumble of items on your countertop? Visual search is tough, and it’s hard to say if Bixby’s visual search is more feature than gimmick. It will also act as something like Apple’s HomeKit, able to control parts of your home from your phone. There’s more stuff Samsung is happy to crow about. You can unlock your phone purely with facial recognition or a fingerprint (maybe not the best security idea, but Samsung clearly thinks it’s something the average user wants). The phone is water- and dust-resistant, has a weird mode that allows it to become a desktop computer, and continues to push the Samsung Connect program — the idea being that it can recreate the closed Samsung ecosystem of products that Apple so successfully instituted. But there’s the smoking elephant in the room. The Note 7 fires. Samsung has promised that it now has an “8-Point Battery Safety Check” to make sure things don’t start going boom again. It’s a big promise from Samsung — its execs have to know that it will only take one or two stories of an S8 going up in flames for the brand to be irrevocably damaged. The coming weeks and months will be nerve-wracking ones for Samsung; their phone division, once riding high and outselling the iPhone, is now on the ropes. But this is all besides the fact. Pick up the phone, and it’s immediately obvious that it’s objectively the best phone you can buy right now. 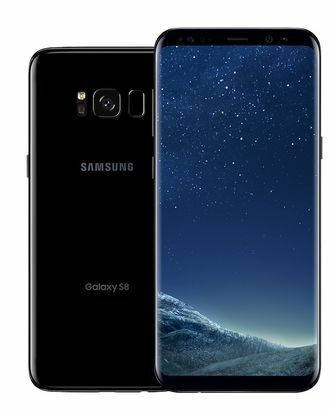 As the smartphone market continues to bifurcate, the class of phone buyer obsessed with having the newest and greatest phone in their pocket will want the Samsung Galaxy S8. The problem? September 2017, when Apple’s keynote for its next generation of smartphones (also rumored to be largely bezel-free) will debut. Samsung has the best phone you can buy on the market right now. But it’ll be interesting to see if that’s true six months from now.